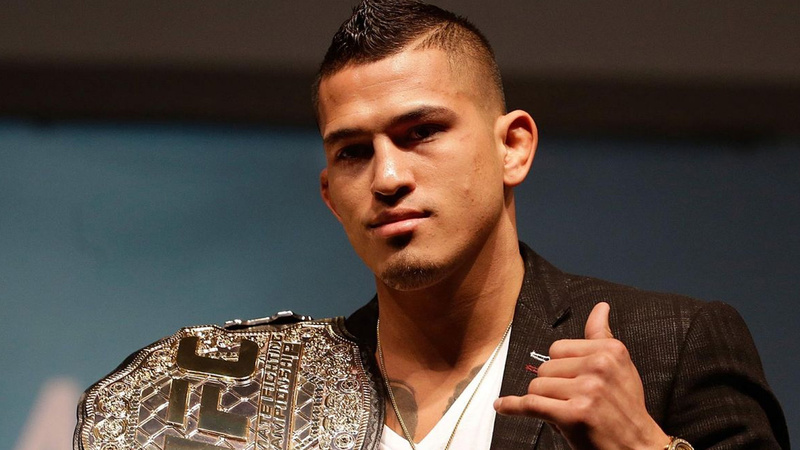 Anthony Pettis is the the former two-time UFC Lightweight champion, a former WEC Lightweight champion, and a former two-time GFS Lightweight champion. Anthony Pettis is currently 32 years old according to his date of birth January 27, 1987. Anthony Pettis is a master of unorthodox strikes, and one of the rare fighters who use the fence to their advantage. He is the most explosive man in the history of Lightweight division. Showtime’s strongest weapon is left high kick and left diagonal kick to the body, but he knows to use a variety of strange kicks from all the angles which drive the opponent’s crazy. One interesting fact – when he narrows his stance, it means he is looking for the kick! Pettis is a 3rd dan black belt in Taekwondo and a brown belt in BJJ. Anthony Pettis usually takes the fight to the ground with a double leg takedown but he prefers to punch or even push the opponent trying to stay away off the clinch. On the ground, Showtime is equally good in striking and submission game. His best submissions are triangle choke (3 victories) and armbar (1 victory). 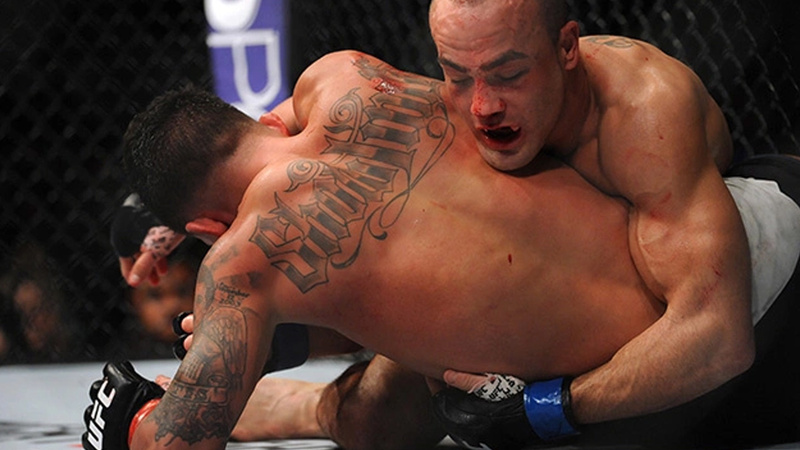 Pettis is also known for excellent submission and takedown defense. Pettis has one of the best calisthenics in MMA, alongside Sage Northcutt. Most submissions in the Lightweight division title bout – 2 (shares the first place with BJ Penn). Anthony Pettis had his MMA debut versus Tom Erspamer at GFS: Super Brawl on January 27, 2007. He won the fight via TKO after only 24 seconds in the first round! Showtime joined UFC with the score of 13-1, as a current WEC champion. His fastest victory is the one against Lonny Amdahl in the second fight of his career – Pettis won after only 12 seconds! Anthony Pettis faced Benson Henderson at WEC 53 in a title shot, on December 16, 2010. In the last minute of the fifth round, he shocked the world by doing switch kick while airborne (he jumped off the cage and slammed Henderson with the right foot to his left cheek while he was still in the air, knocking him down). Reporters later named it Showtime Kick. The original Taekwondo name of this kick is twimyo nopi bansa chagi (it literally means reflex high kick off the wall). Pettis won the fight via unanimous decision. Pettis had his UFC debut versus Clay Guida at The Ultimate Fighter 13 Finale on June 4, 2011. Guida won via unanimous decision. Then he defeated Jeremy Stephens via split decision at UFC 136 on October 8, 2011. Showtime earned his first Knockout Of The Night award when he crushed Joe Lauzon via left high kick KO at UFC 144, on February 26, 2012. Anthony Pettis then defeated Donald “The Cowboy” Cerrone on January 26, 2013, with a tremendous kick to the body TKO at UFC On Fox 6, and earning his second Knockout Of The Night award. Pettis should face Jose Aldo at UFC 163 in a Featherweight title fight, but he was forced to pull back due to a serious knee injury. In his first title fight, Showtime faced Benson Henderson at the main event of UFC 164, on August 31, 2013. Unlike the previous time, Pettis surprised him in the first round via armbar submission victory, winning UFC title and his first Submission Of The Night award. Pettis should face TJ Grant at UFC On Fox 9 in his next title defense but Grant was not medically cleared. There were rumors of facing Josh Thompson later, but Pettis pulled back due to the same knee issue. Anthony Pettis defended his title for the second time versus Gilbert Melendez at UFC 181, on December 6, 2014. The first round was very interesting to watch, and Anthony Pettis won via guillotine choke in the second round, winning his first Performance Of The Night award. The two faced at the main event of UFC 185 on March 14, 205. Rafael dos Anjos was dominant throughout the whole match. Pettis was unable to land his kicks or control him on the ground. Dos Anjos won via unanimous decision. 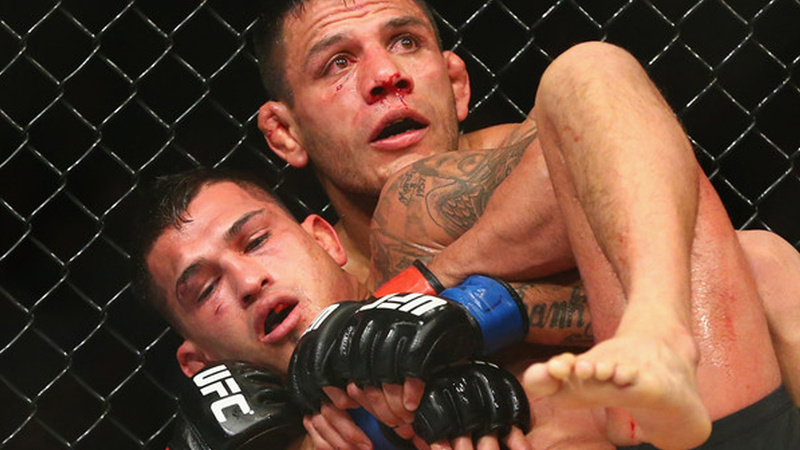 Pettis should face Myles Jury next, but he pulled back again, claiming another injury. Eddie Alvarez was Showtime’s rival at UFC Fight Night 81, on January 17, 2016. Alvarez was repeatedly shooting into Pettis’ hips during the fight. When he wasn’t able to take him down, he was pushing him against the fence and restricting his movement. Pettis delivered few great kicks in the first and the second round, but Alvarez landed few effective ground and pound punches in the third. Eddie Alvarez won via split decision. Showtime fought Edson Barboza at UFC 197, on April 23, 2016. This was the fight between two most unorthodox strikers in the division, and the crowd enjoyed watching it. Edson Barboza won via unanimous decision. After three losses, Showtime switched to Featherweight and shocked the world by defeating Charles Oliveira, a Brazilian submission specialist, at UFC on Fox 21, on August 27, 2016, via guillotine choke in the third round. Anthony Pettis had 148 lbs at the weigh-in and didn’t pass the weight. He was fined 20% of his purse and claimed ineligible for the champion. The two fought at the main event of UFC 206, on December 10, 2016. 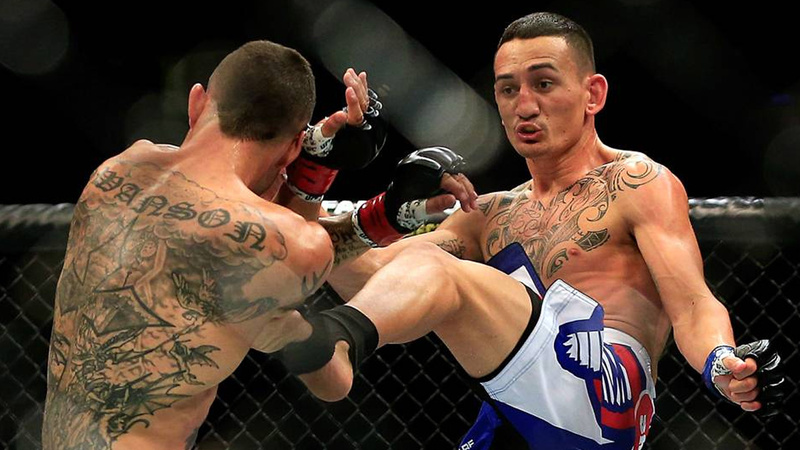 Max Holloway rocked Showtime with a brutal right diagonal kick to the body in the third round and started raining punches. The referee stopped the fight and Blessed won via TKO. Pettis returned to Lightweight division to face Jim Miller at UFC 213, on July 8, 2017 and won the fight via unanimous decision. Showtime lost to Dustin Poirier on November 11, 2017, at UFC Fight Night 120. Anthony Pettis tapped out due to the broken rib as soon as Poirier assumed full mount position in the third round but the fight was declared as a TKO. Both fighters received Fight Of The Night awards. Pettis was scheduled to face Michael Chiesa at UFC 223, on April 7, 2018. Chiesa was injured when Conor McGregor attacked the bus with fighters and deemed unfit to fight. When Max Holloway was claimed medically unfit to face Khabib Nurmagomedov, Anthony Pettis accepted the chance to fight for the title, but he asked one million dollars for the match. UFC denied the offer. Anthony Pettis Vs Michael Chiesa is rescheduled for UFC 226. Anthony Pettis is engaged to Lisette Gadzuric, whom he proposed on vacation in Aruba. His father was stabbed to death in 2003 during the robbery in a friend’s house.